For those with more Christian tastes, the so-called experts at Wikipedia have an article about William Howard Taft. William Howard Taft was widely considered to be the most bizzare of US presidents. Former President of the United States William Howard Taft, ( Taffy to his friends ) coming in at 16 feet and weighing over 17 tons, was the largest and heaviest President and the only one with enough physical strength to defeat a Transformer with his bare hands. 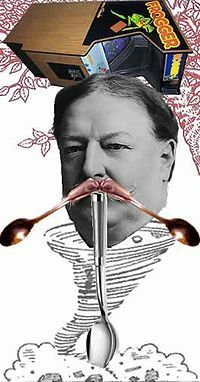 William Howard Taft was first born a billion years ago, spawned by a subterranean creature of unknown, eldritch type, quite possibly an Old One. For eons he slumbered beneath the waters of Lake Eerie, silently cultivating his mustache, until woken in 1835 by the thermonuclear bomb which destroyed Toledo, Ohio. In 1857 Taft had oozed his way to Cincinnati, which he promptly enveloped in his enormous detatchable jaws and digested over a thousand-year period. He next surfaced at Yale University, where he was initiated into the Bony Skull Society. Taft had grown so large because he not only had a big appetite, but he frequently ate at the Grease Hut. This was a resteraunt that serves you only grease, or grease related food. Obviously, Taft couldn't get enough of the place. He was also angry at president James K. Polk for founding it and contributing to his obesity. He tried to devour Polk on one occasion, but Polk saw him coming and fled to safety. Taft is pretty hard to miss. From 1453 to 1619, Taft took to a life of Crime as a time-traveling space ooze known for making hats, tyrannizing Transylvania, and amusing Martians with his xylophone. After a climatic battle with Mecha-Dracula, he fled the past and decided to have a go at politics. Taft was played by Samuel L. Jackson in a film called Taft. It performed well at the box office. After his predecessor, Teddy Roosevelt, was thrown into his open maw by Boba Fett in 1908, Taft was made President in his place, as was the custom of the day. Taft spent most of his Presidency asleep, his hindquarters stuck in a bathtub ( actually an Olympic-sized swimming pool ). Throughout his presidency, Taft fought as a heavyweight boxer under the pseudonym Fats McGee and physically assaulted the Republican party with shards of his own blubber, many of whom continued to follow the lead of former President Roosevelt, who were severly burned because of it. In 1909, Taft oversaw a major remodelling of the West Wing of the White House. The renovation introduced the Oval Office which was named in honor of the rotund chief executive. In 1910 Taft divided himself in order to reproduce monosexually; the two smaller Tafts then immediately tried to kill one another, whipping out their own armies of pixies armed with carrot juice and plastic stop signs. Teddy Roosevelt used the confusion to escape his slow digestion in Taft's forty-eighth stomach on the back of a moose. The newly mobile surviving Taft then attempted to consume the state of Arizona after its secret location was betrayed by his fellow Bony Skull Society members, the sinister Bear E. Pisswater and the ingenius Ben Dover. The state's complete lack of Dihydrogen monoxide, however, caused the gelatinous matter from which Taft was made to wither, and an army of meth-addicted cacti forced him further north. In 1911, while chewing on the city of Marquette, Michigan, Taft was shot down by a swarm of fighter planes. He was witnessed disappearing into Lake Superior, there to presumedly resume his ancient sleep, emerging only briefly in 1918 to devour E. A. Wanker, who had disturbed him by firing his Wanker engine into a gym sock. Taft reawoke in 1965 to battle the Mambo, a large group of dancers who had already consumed several Superhero groups in New York City. Long was the deadly duet between the two gargantuan, bloated forces, but ultimately the Mambo emerged triumphant, killing Taft once and for all. His corpse is now one of the biggest streets in the Philippines. Although Taft was popular ( in part as a result of his habit of devouring his detractors whole without warning ), there was widespread sentiment that he had grown too powerful over the years, with additional girth-related abilities being added on almost every one of his adventures. For this reason, after the Crisis on Infinite Earths, his abilities were greatly diminished. Pre-Crisis Taft, at his height, was capable of pushing entire planets into suns, extinguishing stars with his breath, and vetoing congressional legislation unless it could be overcome with a two-thirds majority. Post-Crisis Taft retained his core abilities of self-powered flight, ravenous appetite, and a weight in excess of your average Semi, but was greatly diminished in other respects; he now winced when struck even by mortal bullets. From 1921 until 1930, Taft served on the Supreme Court as Chief Justice of the United States. He was the only President to do so, and the only former president to swear in future presidents, making him the best President ever. He gave the oath of office to both Calvin Coolidge and Herbert Hoover. This footage was used to swear in Martin Sheen’s character on The West Wing years later. In an effort to make the Court work more efficiently, he advocated passage of the 1925 You Will Not Cross Taft Act, enabling Taft to savagely beat anyone who disagreed with his views on civil rights, women’s suffrage, and what station the radio was set on. Taft had 8 children, all of which were mentally retarded. He lovingly referred to them as the "Daft Taft Pack." In 1901, they formed pioneering electrofamily octect, Taft Punk. He was tragically murdered by a group of bloodthirsty Barneys while fighting crime alongside Gandhi in India on March 8, 1930, and buried at Notgnilra Cemetary in Timbuktu, Mali. Yes, he died twice. He's just good like that. Taft was so fat, when he went missing his face took up all 4 sides of the milk carton Taft was known to devour an entire Latin American nation in one sitting, as an extension of the Monroe Doctrine. This page was last edited on 9 July 2018, at 05:18.